On our second day of the Paris Study Tour, we bookies turned our attention from public institutions to private practice. We visited two private studios during the day, where the conservators were very patient in letting us poke around and answering all of our questions. Aurelia talks to us about her experience as a private conservator. The first studio we visited was 'Ex Libris', which was set up in 2012 and conducts book and paper conservation. 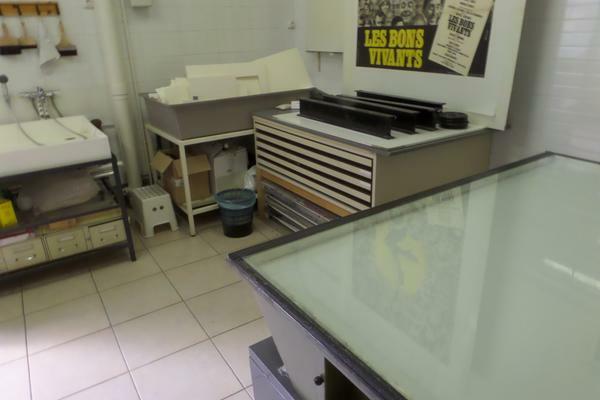 Three conservators share the 50 square metres of studio space. Our host was Aurelia Streri, who kindly let us all crowd into the studio so that we could all be nosy at once. She explained that having three conservators sharing the space is actually very useful from their perspective, as they are able to share materials and also some of the hefty insurance costs that come with running a private workshop. 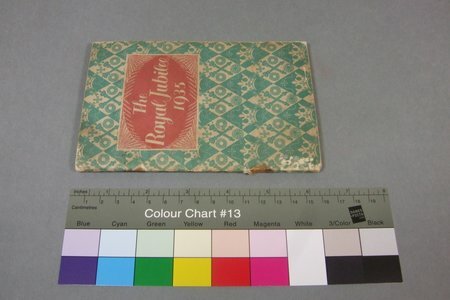 Seeing as all three were book and paper conservators, we wondered whether sometimes they faced competition from one another for contracts, but it turned out that fortunately they all have different specialisations so there isn't actually much overlap. 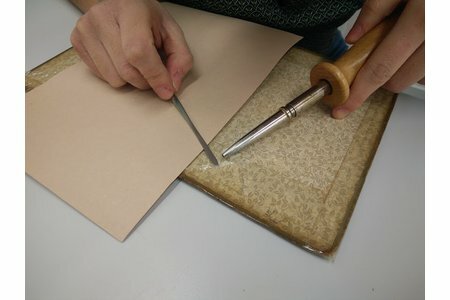 Aurelia, for example, specialises in the conservation of papyrus, and her contracts often take her out of the Ex Libris studio and into museums and institutions to work on papyrus in situ. In fact, it seemed that the conservators actually conducted a lot of their work outside of the studio, travelling to the objects instead of trying to transport them to the studio-with the extra risks that this would entail. In France, the ratio of conservators working in the private vs the public sphere is very different than in the UK. In France, there is an acute shortage of positions in public institutions, so that 90% of conservators work in private practice. We gasped a bit at this figure, and this Brits among us suddenly felt very lucky about being in the UK! 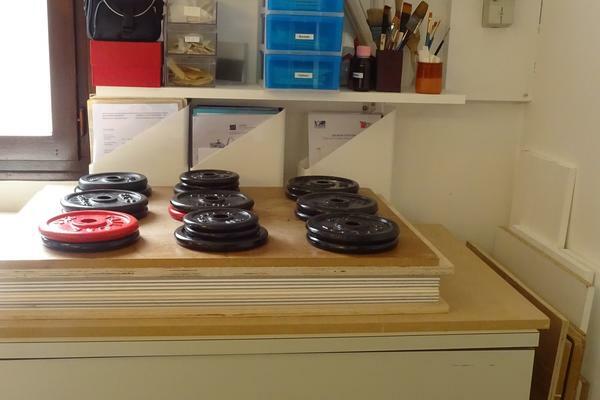 The studio was extremely well organised - everything in its place! There is, however, another difference in French conservation practice that makes the aforementioned figure a bit more comprehensible, and that is the length of their training courses. At the Institut national du patrimoine (INP) (translated, the National Institute of Cultural Heritage), conservation students train for five years, specialising from the very start, so that when they graduate they will have enough experience to enter straight into private practice. Things are a bit different here in the UK. At West Dean College our conservation MA course runs for two years, but there is also an expectation that we will be able to train a bit more while in entry-level positions or apprenticeships. But, as Aurelia told us, even when you have five years' training under your belt, it is not easy to start up in private practice. The first few years are very tough as you have to build your reputation and fight to win tenders. Things get easier once you begin to be known in the field, but you have to be determined to get through those first few years. It wasn't all doom and gloom, though. Aurelia was enthusiastic about private practice, and told us how varied her work was. Private practitioners get to encounter different challenges with different clients, and avoid getting drawn into institutional politics. They also have the opportunity to be constantly innovative with their treatments, and must make sure they keep up with current research and developments. 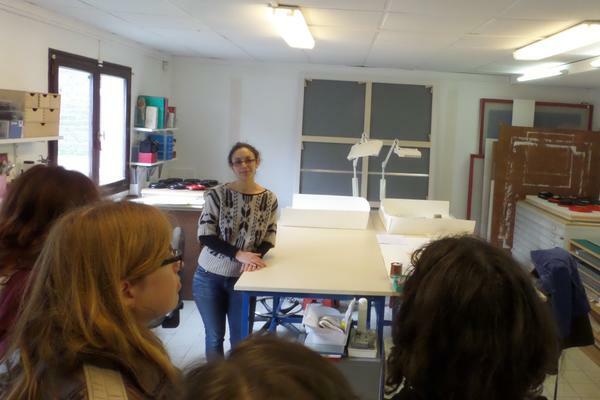 From Ex Libris we went on to visit another private studio specialising in book and paper, this one also shared by three conservators-Marine Letouzey, Paulina Muñoz del Campo and Sébastien Gilot. Marine and Sébastien showed us around. They were in a similar situation to Aurelia, having trained for five years at the INP (then, the Sorbonne) before heading into private practice. Their studio consisted of three rooms, one of which was impressively equipped for wet treatment, even of large format works. Because of the range of equipment they have, they are able to be flexible with what work they can take on. This seemed a very sensible strategy, as it maximised the tenders that they could apply for, giving them the best chance possible of obtaining work. The studio had a lovely, large room for wet treatments, with lots of space for large format work. Marine and Sébastien then showed us a couple of books that they were currently working on. Something we found particularly interesting was that the materials they used to achieve the same effects that we do with entirely different materials. For example, whereas we tend to use aerocotton for board reattachments because of its high folding strength, Sébastien was using layers of spun polyester laminated together, which also formed a strong and durable board attachment. 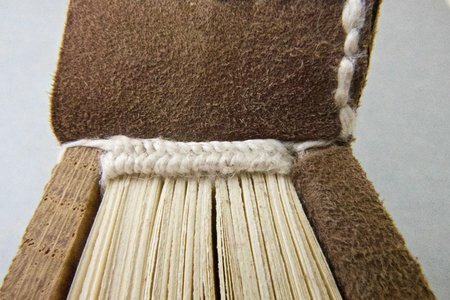 Sometimes, these decisions have to be made because of the difficulty of obtaining particular materials-either because they are less available in France, or because they are too expensive for private conservators to acquire. This brought home to us another reality of working in a private studio: that to succeed you must be both practical and inventive. We're very grateful to Aurelia, Marine, and Sébastien for welcoming us into their workshops and enduring the interrogations we put them to! 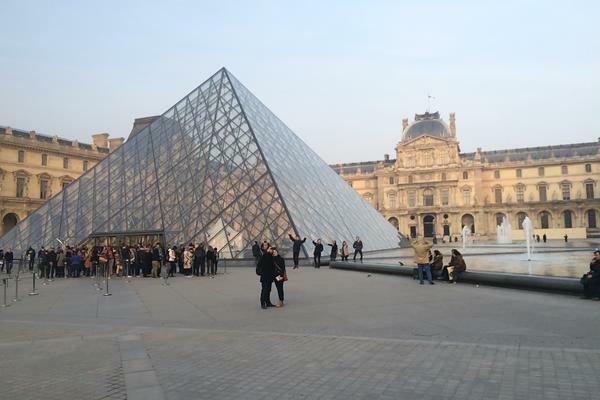 As an added bonus, in the evening we spent some time looking around the Louvre. Quite besides the amazing artwork and objects on display, a highlight of the evening was reached when an unsuspecting Snow took a snap of the great glass pyramid… and got a shot of several enthusiastic bookies along with it! Look closely... you can identify the bookies by their extravagant poses!